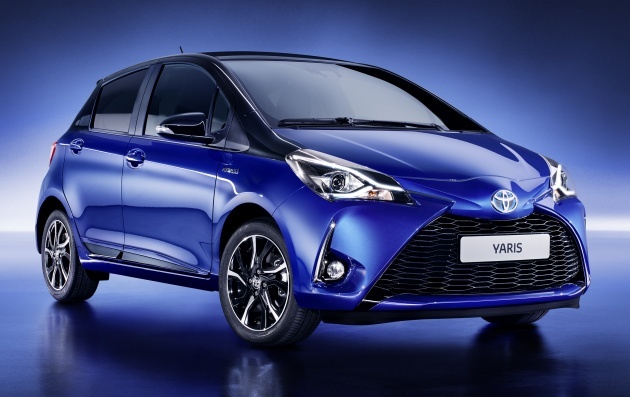 Nearly a month after the new facelifted Toyota Yaris went on sale in Japan (where it is badged the Vitz), Toyota Europe has released full details of the revised B-segment hatchback destined for the Continent. Led by Toyota’s European designers and engineers, with the design handled by the ED2 studio in France, the revamp cost €90 million to develop and features over 900 new parts. As we’ve seen before, the Yaris has been made to look even more aggressive than the already angry-looking first facelift, with the massive lower grille made even wider to emphasise the stance. The fog light surrounds have also been redesigned, with chrome trim on higher-end models – along with projector headlights with forked LED daytime running lights that flow into the upper chrome trim. Along the side, there is a new lower door moulding in either piano black or chrome depending on trim level, while the rear features new two-piece tail lights (LEDs on higher model grades), again to enhance the sense of width. The bumper has also been given a sportier look. New wheel designs include 15-inch hubcaps on the Mid model, 15-inch multi-spoke alloys on the Mid+ and 16-inch machine-finish alloys on range-topping trims. A new trim level is Bi-tone, which adds a contrasting black finish above the beltline, plus projector headlights with LED daytime running lights, a black honeycomb grille, 16-inch alloys, rear privacy glass, a rear spoiler, rear LED lights and piano black door mouldings. The variant is available in Hydro Blue and Tokyo Red (both new colours) upon launch, with Glacier Pearl White and Platinum Bronze coming in the summer. Inside, the instrument cluster has been redesigned and features chrome-trimmed twin analogue dials flanking a new 4.2-inch colour TFT LCD multi-info display, featured as standard on the Mid trim and up – as are piano black inserts on the three-spoke steering wheel. There are also new propeller-style air vents, blue backlighting and revised centre screen and centre console switchgear. New upholstery options include black fabric with a houndstooth pattern on the Entry model, a black-and-grey gradation pattern on the Mid and Mid+ (along with soft-touch plastic on the instrument panel insert and upper door trims), a dual-tone interior colour scheme (matching the exterior) on the Bi-tone model and part-leather black upholstery on the range-topping Chic. Under the bonnet, the old 1.33 litre petrol four-pot is no more, replaced by a new 1.5-litre unit that is part of the company’s Economy with Superior Thermal Efficiency (ESTEC) family. Designed with the future Euro 6c emissions standard and Real Driving Emission (RDE) homologation requirements in mind, it features VVT-iE that enables it to switch between Otto and Atkinson cycles. Other features include a 13.5:1 compression ratio (thanks to the combustion chamber design and new pistons, promoting homogenous fuel/air mixing and rapid combustion), cooled exhaust gas recirculation (EGR) and a water-cooled exhaust manifold. The result is outputs of 111 PS and 136 Nm, a quicker 0-100 km/h sprint (11.0 seconds vs 11.8), a thermal efficiency of 38.5% and up to 12% lower fuel consumption. The Hybrid model has been retained, using the Prius c’s 74 PS/111 Nm 1NZ-FXE 1.5 litre VVT-i engine and 61 PS/169 Nm electric motor to produce a total system output of 100 PS. However, improvements have been made in terms of refinement, including redesigned engine mounts, a larger engine roll restrictor, new front driveshafts and front subframe, a modified air box intake system and a new exhaust sub-silencer. 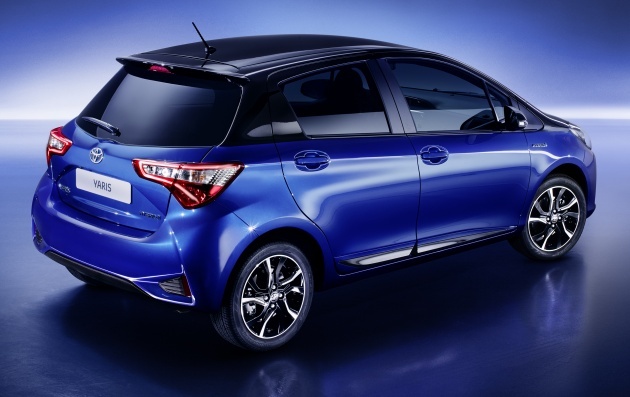 Under the skin, the Yaris benefits from revised dampers, with retuned damping force and valve design to improve comfort without sacrificing handling. The electric power steering has also been reconfigured to reduce friction feel and provide a smoother and more linear response, while the Hybrid’s aforementioned new engine mounts improve ride by reducing vehicle shake caused by engine movement over uneven surfaces. Safety-wise, all models come with Toyota Safety Sense, including Pre-Collision System with Autonomous Emergency Braking, Automatic High Beam, Lane Departure Alert and Road Sign Assist. Additionally, the rear seat belts now feature force limiters and pretensioners, while head restraints and the curtain airbag shape have also been revised. The ISOFIX child seat anchors have also been redesigned to ease installation. Hot hatch? Then what’s a golf gti called?